And the seventies, though that wouldn’t fit in the header. I don’t look as these mags as failures, just as circulation-challenged. I read some of these back in the day. Others I only recently become aware of as an off-shoot in my interest in 1950s ‘zines, but also as part of my quest down the quirky and bizarre by-ways of fiction. We’ll cover eight titles this time around, which is hardly all that fit into this category. Maybe more next week, if you all are interested. 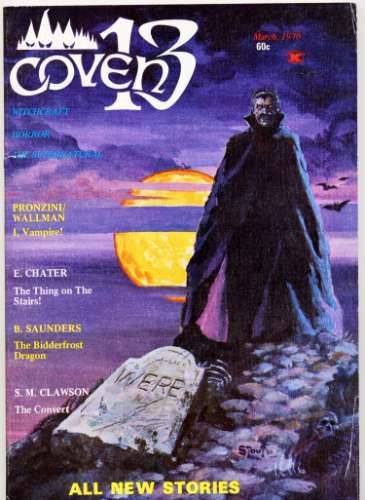 First up is one near and dear to my heart, COVEN-13, which published 4 issues before it changed its title, format, editor, and publisher to WITCHCRAFT AND SORCERY. 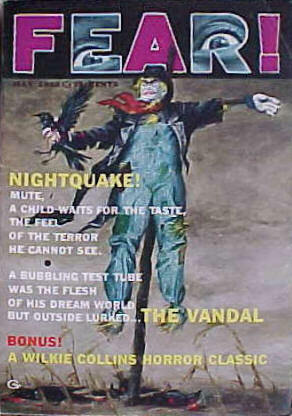 It published 6 more issues under that name, making it the most successful of this week’s short-run ‘zines. 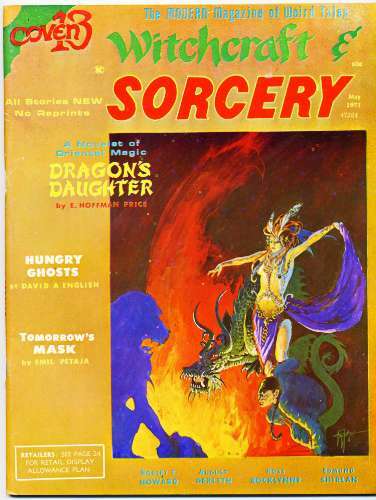 I discovered it on the newsstands when it was COVEN-13, and sent a story off to it after the name change. And they accepted it. I was 16 at the time, and had been sending stories (all thankfully lost now) for about two years to various sf magazines. This was my first acceptance. I was walking on air. Then, they went bankrupt and I never heard from them again. They never printed my story, and, more importantly, never paid me for it, thus, 1) started a trend that lasted far too long, and, 2) taught me a valuable lesson about publishing that has been repeated far too often down through the years. The bastards will break your heart every chance they get. Count on it. 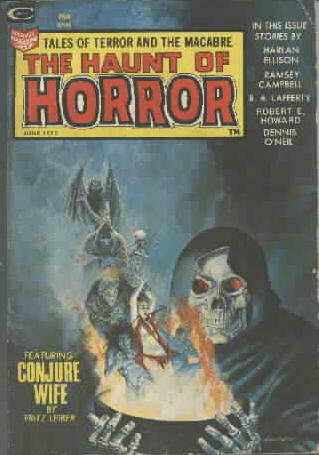 HAUNT OF FEAR, published by Marvel Comics, lasted only two issues in 1973. 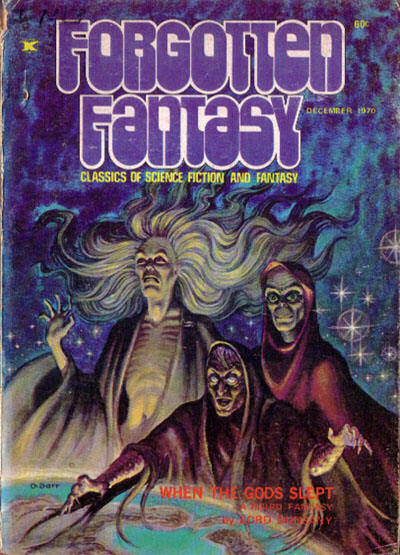 Pity, because they had nice cover art (Gray Morrow and Kelly Freas) and a stellar line-up of authors. Oddly, they ran Fritz Leiber’s CONJURE WIFE as a serial. It’s actually an excellent novel, but it was written in the 1950s. FEAR. Don’t know too much about it. It also lasted only two issues. I have one of them and should read it some day. FORGOTTEN FANTASY was a reprint of 19th century-early 20th century classic tales. It managed to produce five issues in 1970-1971 (I thought it was just four, but I discovered the existence of the fifth while researching this post. Even I learn new stuff from Cheese Magnet.) I picked it up on the newsstand in the day. It introduced to me Lord Dunsany, who is arguably the best fantasy writer of all time, but also, unfortunately, William Bradshaw, and the god-awful GODDESS OF AVATABAR serial they ran, which to this day ranks as perhaps most boring novel I have ever read. BIZARRE! MYSTERY MAGAZINE (three issues in 1965-6) is the only mag I know of with an exclamation point in the middle of its name. More of a murder and suspense mag than fantasy and sf. 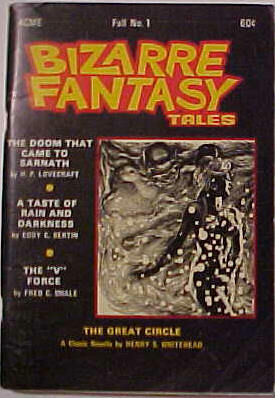 And it’s not to be confused with BIZARRE FANTASY TALES which lasted for two issues in 1970-1. BFS was also a reprint magazines, edited by old-time sf guy Robert Lowndes for Heath Publications. 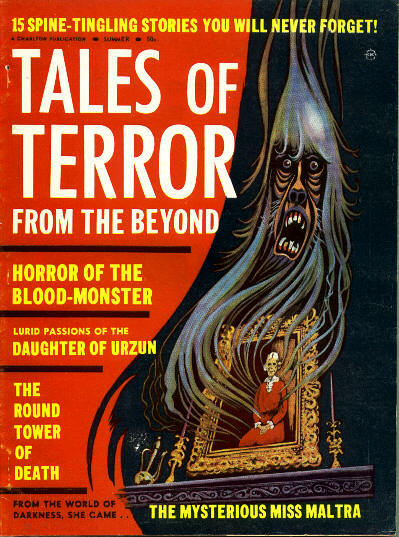 He also edited their other f&sf reprint zines MAGAZINE OF HORROR and STARTLING MYSTERY MAGAZINE, which lasted through most of the 1960s and through the early 1970s. Lowndes did a miraculous job on a minuscule budget, rescuing tons of great stories from the obscurity of the pulps. I don’t know how many people read these magazines, but at least he kept them alive for another generation of readers to discover. He also printed stories by new writers when he could, publishing early stories by R.A. Lafferty, Roger Zelazny, and the very first story of some kid named Stephen King. Whatever happened to him? 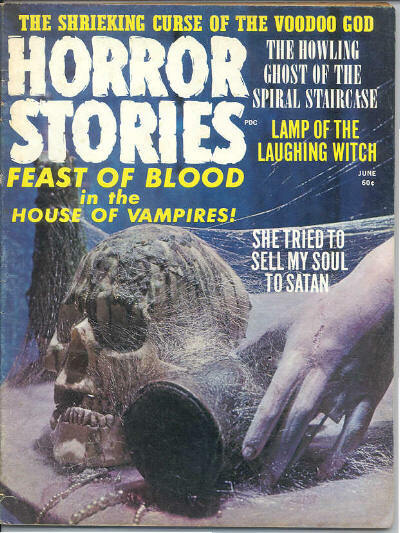 ADVENTURES IN HORROR/HORROR STORIES published six issues in 1970-1. As you see, they eschewed traditional painted covers for photographic ones. Apparently the stories (which, from the covers, seem a tad lurid) take a first-person confessional approach. I also have one of these lying around somewhere that I should read. TALES OF TERROR FROM BEYOND managed one measly issue in 1964. Apparently most of the stories were written by Stanton Coblentz. If that doesn’t make you run away screaming in horror, I don’t know what will.